Ten brave souls teed off in the afternoon after quite heavy rain earlier in the day, but we were blessed with fair weather for the actual nine holes. The course was heavy, and whilst assisting shots to the pin, it made for interesting fairway lies. L-R Michael Sheret, Barry Leithhead & Arthur Penton on the 8th green (click to enlarge). A new hickory participant was welcomed, Arthur Penton from Windsor Country Golf Club. Mention should be made of the efforts of Andrew Wilson and Rob Downie, who ventured from Kiama and Nowra respectively to participate – true hickory aficionados. L-R Arthur Penton, Barry Leithhead & Michael Sheret on the 8th green (click to enlarge). Played as a stableford event, the eventual scores ranged from 18 to 9, whilst individual hole scores ran from zero to four. After being the Club House leader with 15, Tony Pickrell was run down by the next group with the eventual winner eclipsing his good effort. L-R Tony Doggett, Tom Moore & Graham Evans on the 9th green (click to enlarge). Barry Leithhead with 18, Graham Evans with 17 and Tom Moore with 16. Mary Evans carried off the ladies trophy. Barry scored points on every hole, a feat the rest of us could not accomplish, well done Barry. L-R Tom Moore & Graham Evans on the 9th green (click to enlarge). Whilst enjoying our post game refreshments and repast, numerous players presented their Show & Tells items. Amongst those presented, items ranged from pewter card holders, replica featheries, a branded unbreakable iron, a beautifully restored driver by Edgar Oakman, binding twine for repairs to wood, to a set of sheathed irons returned to the Howard family after an 80 year journey. L-R Graham Evans, Mary Evans, Tom Moore & Tony Doggett on the 9th green (click to enlarge). Much information was bandied around the dinner table & a debate on aspects of early steel shafts was particularly interesting. I hope everyone present enjoyed the experience as I did. 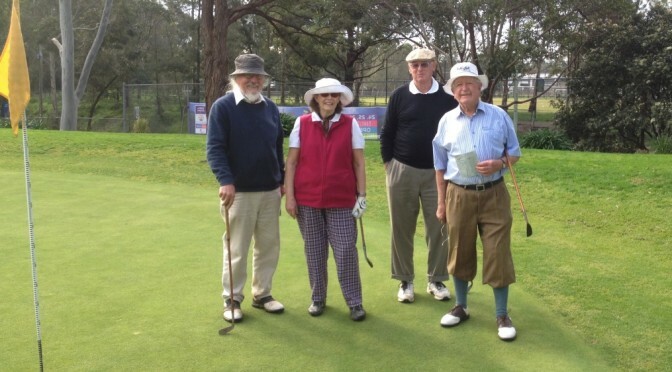 L-R Graham Evans, Mary Evans, Tony Doggett & Tom Moore on the 9th green (click to enlarge). It is interesting to note as a group of hickory enthusiasts we have so much interest and accumulated information to share. I would recommend to those who have not played in one of the Show Tells Days to mark the next one on their calendar.